Fittingly, in the week the eyes of the world are firmly focused on the streets of Leeds for Le Tour Yorkshire, the latest exhibition at Leeds College of Art showcases the best of graffiti and street art. Burning Candy, the internationally renowned graffiti crew responsible for painting streets from Sao Paulo to Miami, via New York, London and Berlin, have touched down in Leeds. Curated by James Jessop and in residence from Monday 30 June to 11 July, Burning Candy’s latest exhibitionis a vibrant menagerie of colour: large-scale painting, sculpture, installation and film. Featuring new and commissioned work by Mighty Mo, Rowdy, Gold Peg, and Horror, the artwork creates a space to reflect on the rich history of painting and sculpture, as well as its modern interpretation, asking reflective questions about elements of memory and obsession. 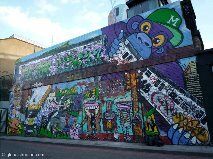 Named by Timeout as one of the most influential forces in street art and graffiti, this is your chance to see some of the world’s best street art, on your doorstep. Burning Candy 2014 is the first in a series of bi-annual curated shows at Leeds College of Art utilising the studio spaces in Vernon Street. More information here.